Hi all. I have had my 98 Cali Special for a year or so now. The shifting has never been much good. In fact it makes my BM gearbox seem good! The main issue is false neutrals while downshifting. I used to get the odd one when upshifting but I have made suitable technique adjustments to avoid these. In fact, I would describe upshifting as not bad. My false neutral situation is getting worse. It definitely worsens with temp increases. Downshifting is not too bad when cold. If I gently preload the shifter prior to throttle off and clutch in then downshifting is more reliable. Shifting down into second is the worst and unreliable even with preloading. When this happens the trans is unwilling to go into second with further attempts and I have to release the clutch to eventually select second with accompanying unpleasant noises. Wondering what the best plan of attack is. I predict I will be pulling the box which I'm not too worried about. I have successfully rebuilt a couple of BM boxes in the past. However, I don't want to do this unnecessarily. I am running mineral 80W90 GL5 oil which I should probably drop to check for metal. I have adjusted the clutch to engage with the lever further out which maybe helped a bit. The shift linkage is not too sloppy. I replaced the shifter bush a while ago although there is still a bit of slop at the lever. There may be a bit of slop at the "transfer rocker" which converts the longitudinal movement to sideways movement of the shift mech, but does not seem too bad. The ball joints don't seem too bad. Bike has 33000 km on it. Is there a good procedure on setting up the linkage mech? I haven't found one by searching. This may be a good next step to eliminate this from the equation. The box does not seem overly noisy apart from crunching out of a false neutral. Neutral with the clutch out is rattly but I assume this is the dry clutch. A bit of gear whine in 5th but not bad. It never jumps out of gear once successfully selected. Any advice on next steps would be greatly appreciated. transformed the changes of my various Tonti's - recommended by RaceCo UK. IIRC 3rd to 2nd does not involve the major cog reorganication that 3rd to 4th/4th to 3rd does. When you change 3rd to 2nd and it baulks, what happens if you change back up to 3rd and then try downshifting again? When you say you adjusted the clutch, do you mean along the cable or at the actuating widget into the back of the gearbox? Thanks for the response. I adjusted the clutch cable at the rear adjuster screw to give a few screws out at the lever for a take up towards the end of the lever travel. It's probably taking up a little later than I'd like but the clutch doesn't slip. When I miss the downshift into second things really get in a mess. Not sure if I've tried shifting back up to third, I'll try this next time it happens. I'm pretty sure it's not going past second into real neutral as when I eventually find a gear it is never first. You need to look at Pete Roper's guide to shimming the gearbox in our FAQ section. It may be worth pulling the clutch operating mechanism out of the back of the gearbox. There is a little radial needle roller bearing (or two) in there called a Torrington thrust race. I had one commit suicide many years ago and it manifested as occasional locking of the gear change as you describe. Something to do with the load on the mainshaft being just enough to baulk the change. You can get the various gubbins out without removing the gearbox. I did mine in the car park in Ramsey on the Isle of Man with the help of various Guzzisti tipping the bike over as required - some angled nose needle pliers are essential though. 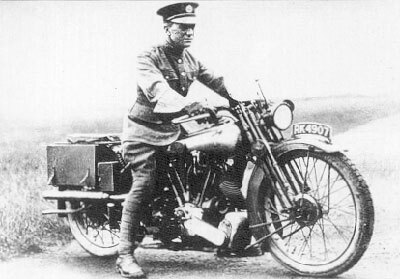 The most difficult part was when my friend gave me a lift to Douglas to pick up the spare part - undertaking a GS1000 Suzuki into the corner after Crosby, flat out on a T3 with the centre stand sparking, is all I remember of that terrifying experience. Not going to help someone in Australia.
" I used to get the odd one when upshifting but I have made suitable technique adjustments to avoid these." What adjustments? Depending, by making upshifting better could have made the downshifting worse. In my experience all the big block Guzzi boxes were stiff and clunky. Yes always worse when hot. I also had a 1983 BMW R80 and yes that was always better. The pedal linkage doesn't help, although the R80 had a linkage too, and was well worn at that, so not convinced that's a complete answer. I found SAE 85/W140 oil with a dash of molyslip helped greatly, also doing the gear change simultaneously with pulling the clutch lever. However one possibility is the pedal is not going down far enough, i.e. reached the end of its travel. Thanks to all for replies. I have had a look at the linkage system and found that the mount at the pedal has come loose. This is despite me loctiting it on previously. The ball joints all seem pretty good but the loose bolt may be causing an issue and would explain the gradual degradation. Will see if tightening this fixes things. 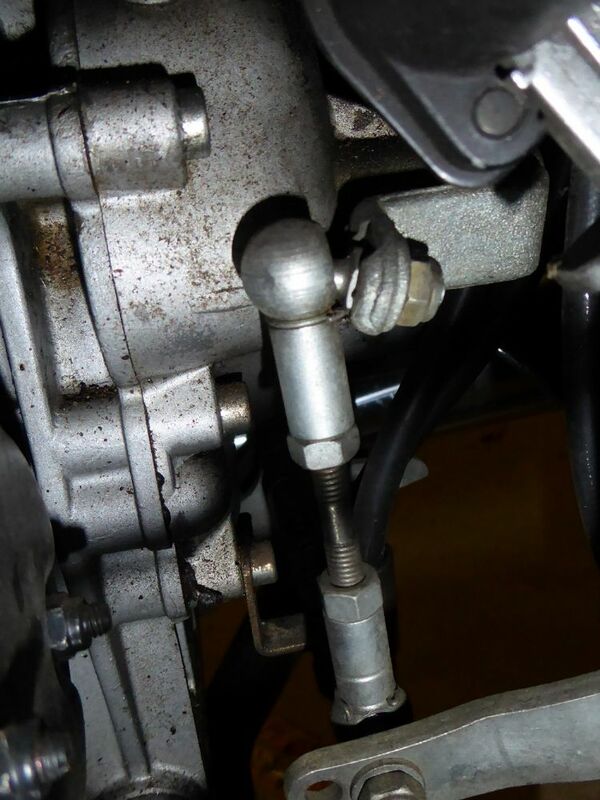 Another question re the linkage, the lever at the gearbox is twisted - see image. This doesn't look right. The bike has been down on the LHS (a previous owner). When I got the bike the front gear shifter was bent up a bit, which I have straightened. This force could have transferred through the linkage and bent the other lever? Or is it supposed to be like this? It looks like a cast piece so it may not be too easy to straighten. Ditto, looks completely wrong to me. OK so now we're getting more info, so it's been dropped on that side which has bent a couple of things. Yes I'm not sure how that g/box lever will take to straightening efforts. I think it is supposed to be steel tho? EDIT: the ball joint should be at right angles to it as far as I know. Yes, definitely, you can just see that in the parts list. I dont think the lever is bent by accident,- looks the same on my LM3. But the angle between the rod and the ball joint should be 90 degrees or close to. The lever is some sort of drop forged steel, its tough and you can easily bend it if you find it necessary. Yes I do now remember there being an angle, so your first pic looks correct. But this now implies that whatever is at the bottom is not right. Not got rearsets on by any chance?